Welcome to another article on VS2017. I’m sure that you have already read my article on installation of VS2017. If not, then read it here. 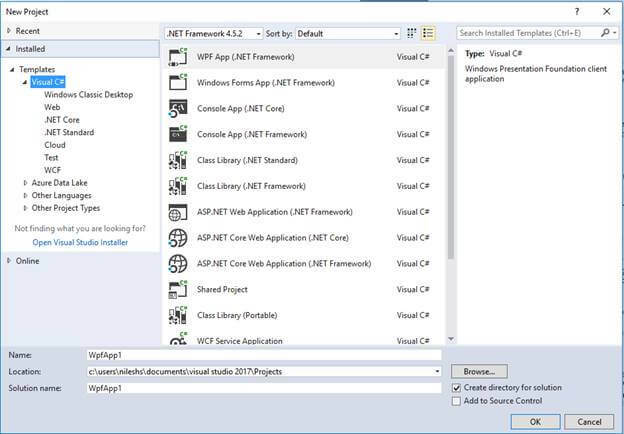 In this article, I will demonstrate some new features of Visual Studio 2017 IDE, which will help a lot in your day to day development. 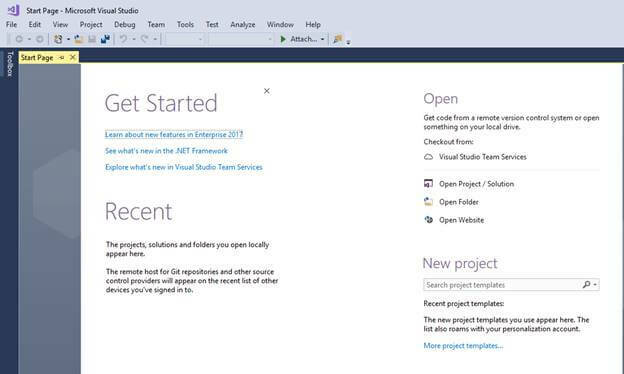 Open VS2017 and you will be shown a welcome page. 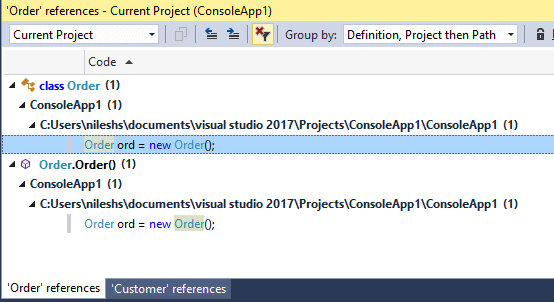 There are two ways to create a new project in VS2017. 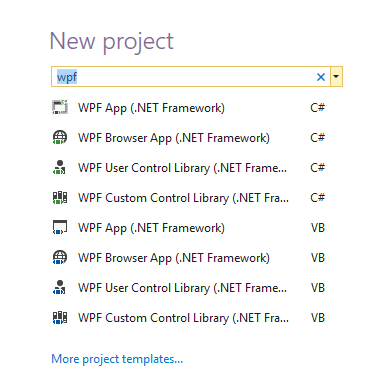 You can write the type of project, which you want to create in the textbox below “New Project” header. You will be shown the type of projects as and when you type in the textbox. There is also another way to create a new project. Click More project templates link just below the textbox. You will be shown a familiar dialog box to create new projects. Let’s start by creating a console Application. 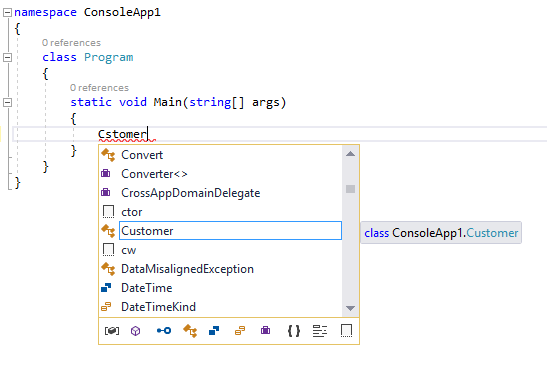 I will introduce some of the new features in VS2017. 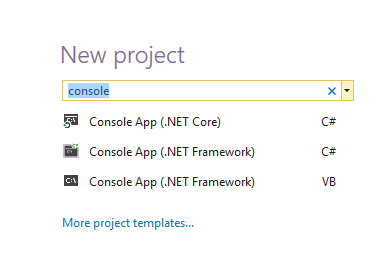 After creating a console Application, go to Solution Explorer and right click on the project to add new class. Let’s say that we are adding new Customer class given below. Now, save the Customer.cs file and go to Program.cs. Write Customer in the Main function, press either Ctrl + T (Control key followed by T key) or Ctrl + , (Control button followed by, key). On the top right, you will be shown a pop-down dialog, which will help you quickly locate the referenced element. Notice that it will quickly launch the “Customer.cs” file too. 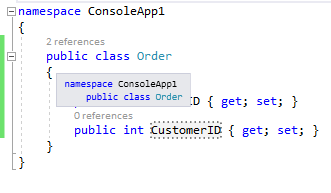 In this way, you can have a look at a referenced class and its properties quickly without the need to open the relevant file in IDE. You can simply press ESC key, the dialog, file and both will close. VS2017 introduces a new feature called “fuzzy matching”, which means when you type a name and even if you misspell it, VS2017 will show you the results, which are based on fuzzy match. To experience it, let’s go to Program.cs -> Main method again. Write the line given below in Main method. Now, place the mouse cursor on “Custmer” word, press “Shift” + “F12” keys. You will be shown a new “references” Window, which has been modified compared to “Find Symbol Results” Window in VS2015. Notice in the “references” Window, there are many new things here like Filtering (on left side), Group by, Search, “Keep Results” button, Sorting and Colorization. Let’s see each of them one by one. 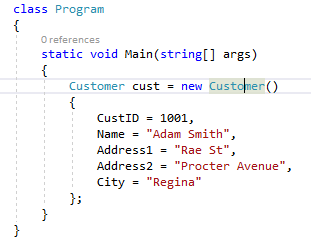 In VS2015, when you find all the references on a class or property, you will be shown all the referenced results with no option to filter them. Now, in VS2017, you have filtering option in references Window. See on the left side that there is a drop-down and by default Entire Solution is selected. You can filter the references; based on which area you want to see and VS2017 will only show you the relevant references. Let’s say you select “Definition, Project then Path” option and you will see the references group, as shown below. On the top right section of “references” Window, you can search inside the “references” results. This is a new interesting feature. 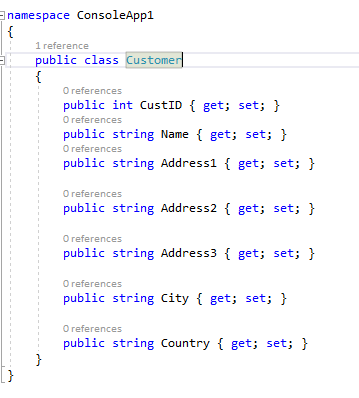 Remember in VS2015 when you are already looking at one references result and you want to find another class or property reference too. If you search in another class reference, your previous result will be overwritten. You can see only one reference result at a time. If you press “Keep Results” button on the references Window and you search for another term, then your original result will be preserved and you will be shown references in a new Window. Let’s say that you create a new “Order” class and reference it from Main method. Press “Keep Results” button on the references Window of customer results, go to Order class and press Shift + F12. You will be shown references in another Window. At the bottom of the Window, you will be able to find a tab for “Customer” references too. You can now click on the results column headers like Code, File, Line, Col and Project to have your references result sorted by these columns, which were missing in VS2015. Notice the references are displayed in different colors to help you in clear understanding of the references. A dotted vertical line now runs between the curly braces to identify scope. If you mouse over the dotted line, then you will be shown the current scope. VS2017 has improved refactoring a lot to make the code more readable. Let’s consider some new improvements. If you have written the code step by step to assign the values to an object’s property, VS2017 refactoring will now suggest you to use an object initialization. Write the code given below in Main method. 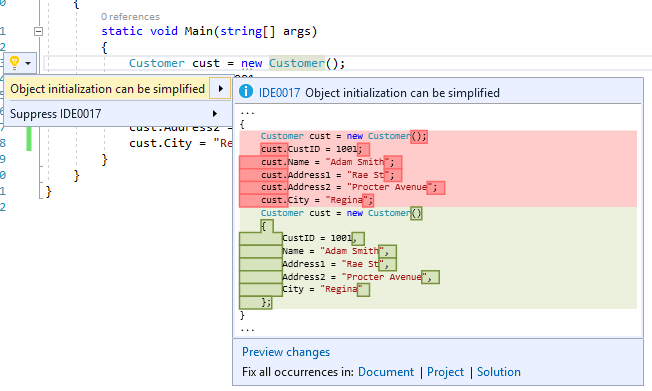 VS2017 will give you a message “Object initialization can be simplified”. Click on the suggestion and your code will be modified, as shown below. 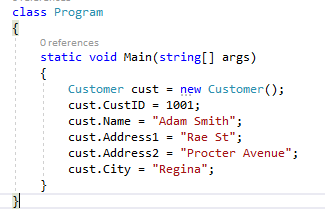 Add missing case(s) to a Switch statement. There are many more new features of VS2017 but for the scope of this article, I will restrict to above five only. Go and install Visual Studio 2017 on your PC to find out more by yourself.